A Super Cute Kids Flag Craft! Paint a blue square on the palm of hand. Paint white and red alternating striped down the fingers. Press hand down onto light blue paper to make a print. Once dry add a star to the blue area using the white paint marker. Mount on slightly larger red paper to create a frame. Hang this flag craft up for Memorial Day or the 4th of July. Or better yet, make it into a card to send out to a Veteran or Service Member. 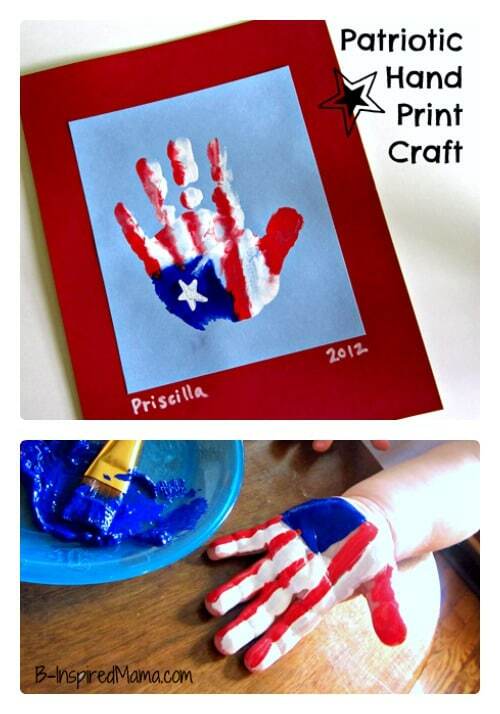 Follow B-Inspired Mama’s board Patriotic Kids Crafts and Activities on Pinterest. How do you celebrate Memorial Day and The Fourth of July? Do you do any patriotic activities or flag crafts? I’d love to hear about them in the comments below! Thanks for the idea! I plan to share these with others too! My daughter loved making this handprint craft!!! Aw – so glad she liked it! I love this!!! Definitely going to be trying this out for 4th of July!! This is so fab. I might try an Australian variation of this for Mr 4. This is such a wonderful craft! I love your final product! Changing the square for a triangle I get my country's flag (Puerto Rico). Great idea. Thanks for sharing. My son's kindergarten class made these on white t-shirts with fabric paint! They used glow-in-the-dark paint for the “white” spots and embellished the shirt using sponge star stamps. Super cute! Too cute! I found you through Delicate Construction. Thanks for sharing! Fabulous! Love the way yours turned out, too! Love this craft! I love your ideas of painting the hand in stripes vertically!! I'm a little late to post this for Memorial Day, but I shared in on Craft Gossip for the 4th of July!! Oooops, I missed it this week. But I'll have to add that to my linky party list. Thanks for visiting, Mackenzie! Love these, A LOT! i wonder if I can get my teens to let me do this on them?? lol I would LOVE for you to come link this up in my Red, White and Blue link up!! Thanks, Susie. I'm off to link up and check out all of the patriotic ideas. i love handprint art! pinning this to my patriotism for kids board! Thanks, Andie! I think every mama loves handprint art. haha! Yes, you're right. Everything's better with glitter!